Back in the very early days of this century, one of the best disruptive services to emerge after the dotcom bubble was Skype, the free software program that lets you make and receive phone calls over the internet for free with other Skype users, and at very low prices compared to the phone companies when calling a landline or mobile phone number at home and abroad. I signed up for Skype in mid 2004 and have been a user ever since. It was instrumental in making it possible to start a podcast in 2005. Even though I’ve used it far less in recent years – my mobile phone offering better convenience, connectivity, ease of use and very low costs on my plan are the prime reasons – I’ve kept my SkypeIn online number going as it’s a useful tool for business especially when someone wants to call you. 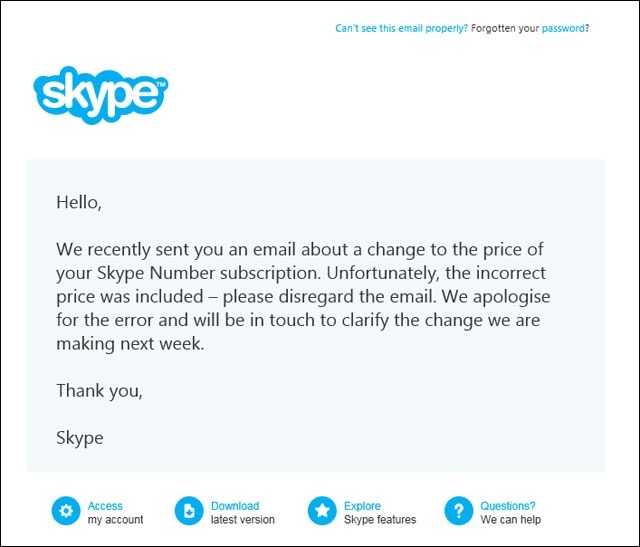 There’s a cost for a SkypeIn number, currently €24 (£17, $26) a year. That’s only €2 a month, a worthwhile low investment for what you get. But when I received an email a few days ago informing me of a price increase to continue subscribing to my SkypeIn number, the game changed. The email let me know that the cost of my subscription would be increasing to €22.14 a month at the end of November. They didn’t say how much of an increase that is over what I’m currently paying. I do know it’s huge, though, as the new price of €22.14 is per month compared to the €24 per year I currently pay. I’d assumed the email was an error and so I patiently awaited the follow-up correction. It came on Friday night. While I’ll look out for the next email in the coming week, my inclination now is to ditch the SkypeIn number entirely when it’s due to renew next March. Yes, it is convenient to have but in looking back this year, I see no one has used it at all. So it looks like I can spend whatever the increased price will be on something else more worthwhile. As far as Microsoft’s communication about SkypeIn goes, its ham-fisted execution doesn’t build any confidence nor will it make some consumers feel that it’s worth having or continuing with. In the consumer market, there are alternatives. As for Skype itself, I will keep that account going. Skype has evolved hugely since its start as a voice application over a decade ago, especially since it was acquired by Microsoft in 2011, offering way more services today than just making and receiving audio phone calls. Especially interesting are some of the plans Microsoft has in areas like Skype integration with Hololens virtual reality experiences. In business, Microsoft just announced Skype integration with Office. It launched Skype for Business – a tool I’ve been using for the past few months: a worthy successor to Lync – a few months ago which looks extremely interesting when you think about what is credibly possible as illustrated in this future-look video Microsoft published in March.